This morning, in the penultimate show and tell of the year, Helen West gave a summary of where the team is on the essex.gov.uk project. Specifically she talked about the transition from Alpha to Beta. In agile ways of working, the alpha stage is characterised by prototyping, testing, and learning from the results. 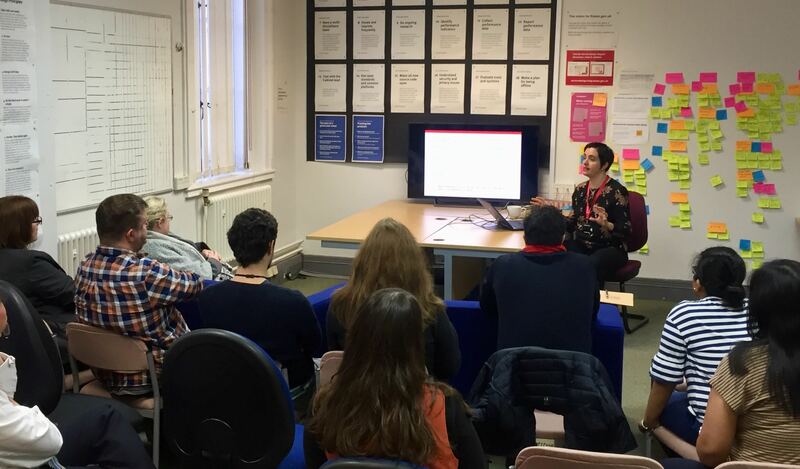 In Alpha we built a prototype to demonstrate how the new site templates might work, using the Government Digital Service prototyping kit, added redesigned Adult Social Care content and lab tested it with users. Beta phase, in general, is about building a working version of the product or service you want to deliver. At this point it's about verifying that it works for both the public and system managers as well as complying with performance, security and accessibility standards. Right now the content designers are working on redesigning content covering education, business, running the council, registrars and blue badge. Helen also mentioned that the complicated business of migration planning work has begun and that there is a lot of work to do on creating better search functionality , building on the information architecture work done so far. She'll be covering the work done in alpha so far and the move to beta in more depth in a forthcoming blog post. The final show and tell of the year, in C309, is scheduled for 19 December. In it we’ll be reviewing the work the team has done in 2018. Look forward to seeing you!